In the Middle Ages, Catholics called the Feast of the Purification of Mary or the Presentation of the Child Jesus in the Temple, Candlemas [February 2]. There was a candle-lit procession around the parish church. When the parishioners sought to enter, their priest met them at the door holding a statue of the Holy Child, the Light of the World. hence the Name, Mass of Light. The Candlemas Mass includes passages about the Holy Child Who suffers to heal, save and rescue, that is, as a Pilgrim Himself, because He loves us. But devotion to the Holy Child or "Divino Nino" did not begin then, but at the first Christmas, and even before through the tender regard that Saint Joseph had for the Mother of God and the awaited Savior King Who was adored in the manger crib by the three Kings who were not ashamed to worship God in His tiny Sacred Humanity, unlike the rebel Angels who would not adore The Second Person of the Holy Trinity in His Humanity when shown Him Incarnate. Ever since that first Christmas, the Mother of the Infant King has been depicted with her Son in her arms. Eventually, the Infant Jesus, in works of art, was separated both from His Mother and the manger scene, and images of the Christ Child Himself, began to be venerated as part of everyday piety. Popular devotion to the Christ Child has various, distinct histories: the Infant King today has numerous titles with varied images and a history to match, throughout the world. The history of the Church, her early writings, centuries of the liturgy, the arts, the lives of the Saints, and the histories of religious orders all provide us with ample examples of the cultural dimension of this devotion. 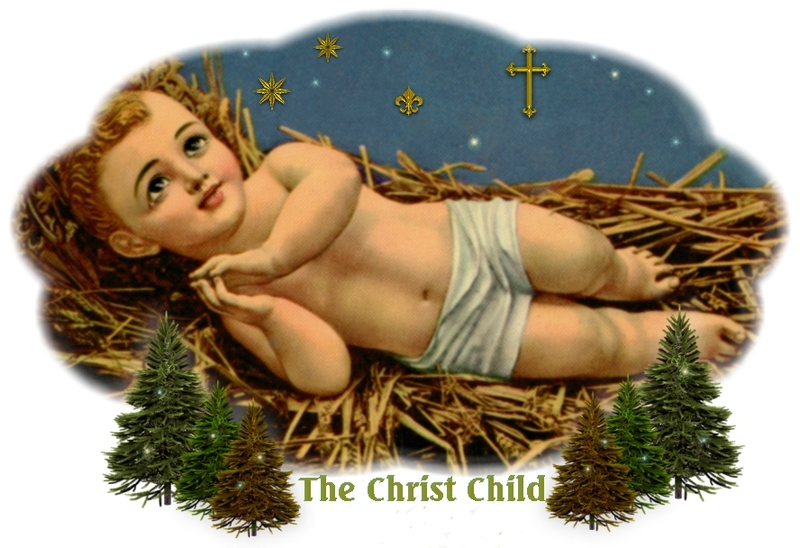 Through the depictions of the Christ child, we have a greater appreciation for the Divine Infancy of Our Lord, which we can contemplate to assist us in our own lives. WE apply the name of Christmas to the forty days which begin with the Nativity of our Lord, December 25, and end with the Purification of the Blessed Virgin, February 2. It is a period which forms a distinct portion of the Liturgical Year, as distinct, by its own special spirit, from every other, as are Advent, Lent, Easter, or Pentecost. One same Mystery is celebrated and kept in view during the whole forty days. Neither the Feasts of the Saints, which so abound during this Season; nor the time of Septuagesima, with its mournful Purple, which often begins before Christmastide is over, seem able to distract our Holy Mother the Church from the immense joy of which she received the good tidings from the Angels on that glorious Night for which the world had been longing four thousand years. The Faithful will remember that the Liturgy commemorates this long expectation by the four penitential weeks of Advent. The custom of celebrating the Solemnity of our Saviour's Nativity by a feast or commemoration of forty days' duration is founded on the holy Gospel itself; for it tells us that the Blessed Virgin Mary, after spending forty days in the contemplation of the Divine Fruit of her glorious Maternity, went to the Temple, there to fulfill, in most perfect humility, the ceremonies which the law demanded of the daughters of Israel, when they became mothers. The Feast of Mary's Purification is, therefore, part of that of Jesus' Birth; and the custom of keeping this holy and glorious period of forty days as one continued Festival has every appearance of being a very ancient one, at least in the Roman Church. And firstly, with regard to our Saviour's Birth on December 25, we have St. John Chrysostom telling us, in his Homily for this Feast, that the Western Churches had, from the very commencement of Christianity, kept it on this day. He is not satisfied with merely mentioning the tradition; he undertakes to show that it is well founded, inasmuch as the Church of Rome had every means of knowing the true day of our Saviour's Birth, since the acts of the Enrollment, taken in Judea by command of Augustus, were kept in the public archives of Rome. The holy Doctor adduces a second argument, which he founds upon the Gospel of St. Luke, and he reasons thus: we know from the sacred Scriptures that it must have been in the fast of the seventh month that the Priest Zachary had the vision in the Temple; after which Elizabeth, his wife, conceived St. John the Baptist: hence it follows that the Blessed Virgin Mary having, as the Evangelist St. Luke relates, received the Angel Gabriel's visit, and conceived the Saviour of the world in the sixth month of Elizabeth's pregnancy, that is to say, in March, the Birth of Jesus must have taken place in the month of December. But it was not till the fourth century that the Churches of the East began to keep the Feast of our Saviour's Birth in the month of December. Up to that period they had kept it at one time on the sixth of January, thus uniting it, under the generic term of Epiphany, with the Manifestation of our Saviour made to the Magi, and in them to the Gentiles . . . The homily we have just cited, which he gave in 386, tells us that the Roman custom of celebrating the Birth of our Saviour on December 25 had then only been observed ten years in the Church of Antioch. It is probable that this change had been introduced in obedience to the wishes of the Apostolic See, wishes which received additional weight by the edict of the Emperors Theodosius and Valentinian, which appeared towards the close of the fourth century, and decreed that the Nativity and Epiphany of our Lord should be made two distinct Festivals. The only Church that has maintained the custom of celebrating the two mysteries on January 6 is that of Armenia; owing, no doubt, to the circumstance of that country not being under the authority of the Emperors; as also because it was withdrawn at an early period from the influence of Rome by schism and heresy. In the latter half of the fourth century we find a nativity painting in the Catacombs in Rome; in 440, Pope Sixtus III erected a manger, a replica of the crib at Bethlehem. Nativity or miracle plays were abundant and popular by the tenth century. In the early thirteenth century, St. Francis of Assisi is given credit for staging the first live crèche scene. The earliest known artifact depicting Jesus as a Child separate from His mother dates from around 1260 and is a small marble statue generally attributed to Nicolo Pisano. The Child is shown standing, His right hand raised in blessing, with His swaddling clothes starting below His chest, falling over His elbows and down His sides. Several replicas of this image have survived, in a variety of materials, and although I was not able to obtain a picture of one of them, their existence provide the evidence of the rapid spread of devotional practices regarding Christ Child. In the fourteenth century, a custom began in Germany and Austria of rocking the Christ Child's image in a cradle. The priest would carry the cradle to the altar and rock it while the parishioners sang and prayed. The liturgy ended with the devotional kissing of the Christ Child at the altar rail. The custom was a substitute for the nativity plays, which had been banned at that time by the Church because of abuses. By the sixteenth century, cradle rocking was also banned in churches, but it survived for a long time as a devotional practice in convents and private homes. A number of these cradles are still extant. During the late Middle Ages, devotion to the Infant Jesus had entered the private sphere of popular piety. Numerous documents show that images of the Christ Child in the homes of the nobility and in convents. By the time of the Renaissance, some of the images were sculpted by famous artists, and many of the statues of the Christ Child were produced in convents. For the nuns, the very act of modeling the holy Child became a form of devotion, and they tenderly cared for the images entrusted to them. One such center was at the Dominican convent of Lucca where the nuns carried on a tradition established by Sister Costanza Micheli (born 1530) of making small devotional images of the Christ Child. Later, Venerable Sister Isabella Chiara Fornari (born 1697), superior of the Franciscan Poor Clare Sisters in Todi, Italy, sculpted life-size images of both the Infant Jesus and the Infant Mary in a process using wax, which made them very lifelike. Perhaps her most famous sculpture is that of the Maria Bambina, an image of the Virgin Mary as a child, which is venerated in the motherhouse of the Sisters of Charity in Milan, Italy. Although the art of wax sculpting is dying out, small replicas of the image are still made by one of the sisters. Perhaps the best known and widespread devotion is that of the Holy Infant of Prague. We have a sub-directory on the Holy Infant, in the Christmas directory. 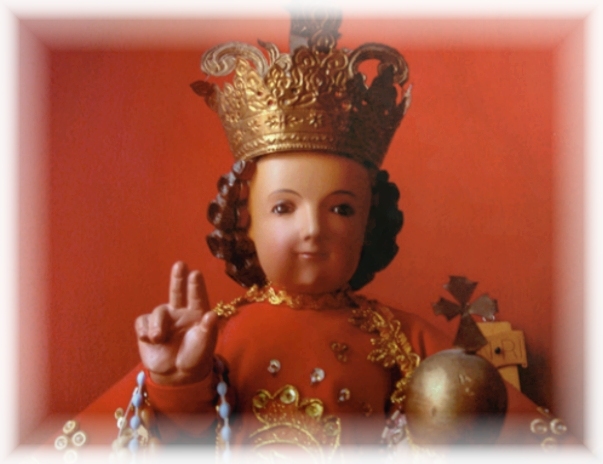 The image of the Santo Niño de Cebu is a wooden image. The one above is a popular replica. Someone place a set of Rosary Beads around the arm of the Christ Child in devotion. The holy image is thought to have been given by Ferdinand Magellan to Queen Juana as a gift for her Baptism. In 1519, Magellan set forth on an expedition for the King of Spain in search of spices. He landed in Limasawa, in the central part of the Philippines. Magellan claimed the islands for Spain and named them after King Philip. Magellan headed for the island of Cebu, where he was warmly received by the King Humabon and Queen Juana. Both the King and Queen converted to Catholicism. In exchange for their hospitality, Magellan joined King Humabon’s forces in a battle against a neighboring tribe. Unfortunately, Magellan died in the battle. Upon this, his men returned to Spain. In 1565, another expedition led by an Augustinian monk, Andres Urdanata, set out from Mexico and arrived in Cebu on April 27. The Cebuanos, suspicious that the Spaniards had returned to avenge Magellan’s death, waged war on the Spaniards. They were, however, no match for the heavy artillery and cannons of the Spanish soldiers. The natives were forced to flee, leaving their town to burn. In one of the burnt houses, a Spanish Soldier found the image of the Santo Niño in a wooden box, miraculously spared from any damage. Since then the miraculous image has become the Patron Saint of the Cebuanos. Many miracles have been attributed to the Child Jesus under this devotion. The Spaniards built two churches over the location in which the Santo Niño was found. These were built with wood and nipa, and both were destroyed by fire. The present church dates from the year 1735. In 1965, it received the title of "Basilica Minor del Santo Niño". 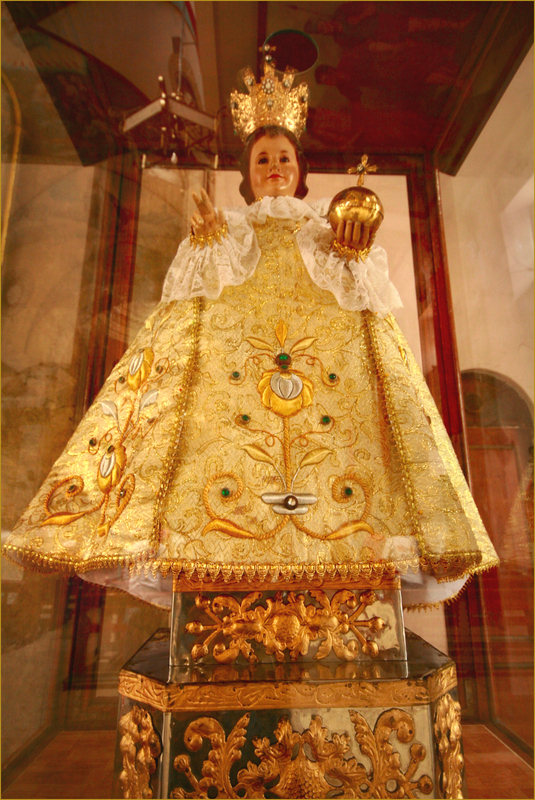 The original statue is kept in the convent and a replica, adorned with gold and stones, is kept behind glass in the Basilica del Santo Niño. For centuries, devotion to the Holy Child continues to grow, due to the many favors and miracles granted to the faithful by Jesus. Every third Sunday in January, a great feast is held to honor the Holy Child. Millions of people crowd the streets in celebration of the Feast of the Santo Niño of Cebu.